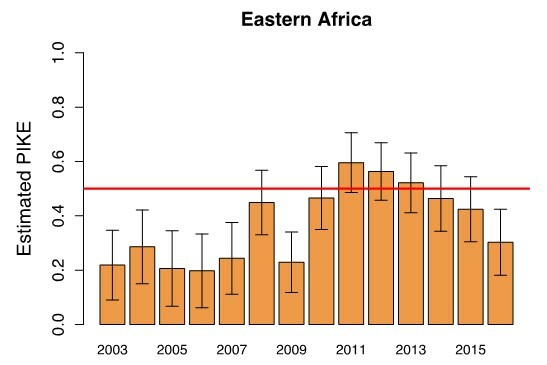 Geneva – The latest CITES report on the status of elephants and ivory trade reveals that in 2016, the overall downward trend of elephant poaching in Africa continues, with significant declines seen in East Africa. At the same time, 2016 records the highest level of seizures of illegally traded ivory by weight since commercial international trade was banned by CITES in 1989. “The global collective effort that is underway is starting to reap positive results, but we are certainly not there yet. We must persist and drive home the advantage we have while the political momentum is with us and the financial and technical support that goes with it. And while the African elephant is seeing some gains it is not across all regions, with some local populations still under serious threat, and other species are now being increasingly targeted by transnational criminals, especially high value timber,” concluded Scanlon.